Special Report: Former President Gerald Ford Dies Gerald R. Ford, the 38th president of the United States and the only one to assume the office without being elected president or vice president, has died. He was 93. Former first lady Betty Ford announced his death Tuesday in a brief statement. "His life was filled with love of God, his family and his country," she said. 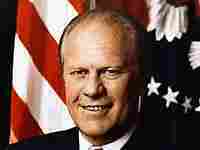 President Gerald Ford died Tuesday at the age of 93. Ceremonies for President Gerald R. Ford will begin Friday at St. Margaret's Church in Palm Desert, Calif., which Ford and his wife, Betty, frequently attended. A family prayer service will be followed with visitation by friends and a period of public repose. Ford's body will be flown to Washington, D.C., late Saturday afternoon. His hearse will pause at the World War II memorial in a joint tribute to the wartime Navy reserve veteran and his comrades in uniform. The state funeral will be conducted in the Capitol Rotunda on Saturday evening. The public will be able to file in to pay last respects after the state funeral. Ford will lie in state in a closed casket until Tuesday morning. And in a departure from tradition meant to highlight his long congressional service, Ford's remains will also lie in repose outside the doors of both the House and the Senate for short periods. "I know personally how much those two tributes themselves meant to President Ford," said family representative Gregory D. Willard, who detailed arrangements in a news conference in Palm Desert, Calif.
On Tuesday, there will be a funeral service at the National Cathedral in Washington, D.C. Ford will then be interred on a hillside near his Grand Rapids, Mich., presidential museum. 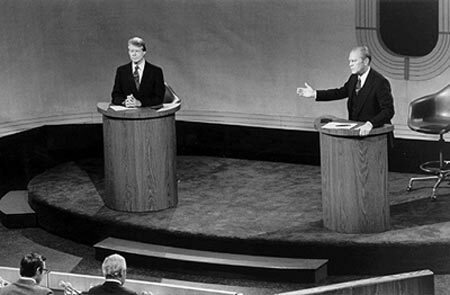 President Ford and Jimmy Carter meet during the first of the three presidential campaign debates, Sept. 23, 1976. * Recorded as part of a WHYY special on former U.S. presidents. July 14, 1913: Born in Omaha, Neb. 1914: Moves to Grand Rapids, Mich.
1931: Graduates from Grand Rapids South High School, where he played football, basketball and track. Earned all-city and all-state honors in football. 1935: Graduates from the University of Michigan. Majored in economics and political science. Played center and linebacker on the university's football team. Received contract offers from the Green Bay Packers and Detroit Lions, but turned them down in favor of law school. 1941: Graduates from Yale University Law School, where he'd served as assistant football coach and freshman boxing coach. 1941-1942: Returns to Grand Rapids to open a law practice. 1942: Joins the U.S. Navy following the attack on Pearl Harbor. Remains on active duty until 1946. Is discharged with the rank of lieutenant commander. Remains in the Naval Reserves until 1963. Oct. 15, 1948: Marries Elizabeth Bloomer Warren. They go on to have four children: Michael Gerald (March 14, 1950); John (Jack) Gardner (March 16, 1952); Steven Meigs (May 19, 1956); and Susan Elizabeth (July 6, 1957). 1948-1973: Represents Grand Rapids and Kent County in the U.S. House. Serves as House minority leader from 1965 to 1973. Dec. 6, 1973: Confirmed as Richard Nixon's vice president. Succeeded Spiro Agnew in that job following Agnew's resignation. Aug. 9, 1974: Sworn-in as president following Richard Nixon's resignation. Goes on to select Nelson Rockefeller as his vice president. Sept. 8, 1974: Pardons former President Richard Nixon. Jan. 20, 1977: Leaves office after losing the 1976 presidential election to Democrat Jimmy Carter, the former governor of Georgia. Gerald R. Ford, the 38th president of the United States and the only one to assume the office without being elected president or vice president, has died. He was 93. Former first lady Betty Ford announced his death Tuesday in a brief statement. "His life was filled with love of God, his family and his country," she said. Ford had been living at his desert home in Rancho Mirage, Calif. He had battled pneumonia in January 2006 and underwent two heart treatments -- including an angioplasty -– in August at the Mayo Clinic in Rochester, Minn.
"He assumed power in a period of great division and turmoil," President Bush said in a televised statement on Wednesday morning. "For a nation that needed healing and for an office that needed a calm and steady hand, Gerald Ford came along when we needed him most." Ford came to the White House after having been appointed vice president, the first such appointment under a new constitutional amendment. And then he took over the presidency when, in another first in U.S. history, a president stepped down. It was a harrowing time in the United States, and the possibility that a president might be impeached and thrown out of office seemed likely. Ford had never run for national office and was not even very well-known. Yet he clearly understood the great sense of relief with which the American people greeted their new president on Aug. 9, 1974. "My fellow Americans, our long national nightmare is over," he said after taking the oath of office. "Our Constitution works; our great republic is a government of laws and not of men. Here the people rule." The long national nightmare, Watergate, started with the so-called "third-rate burglary" of the national Democratic Party headquarters in June 1972 at the now-famous building on the banks of the Potomac River. The burglary and the reasons for it faded away over the next two years, as a series of investigations revealed that President Nixon had been personally involved, perhaps not in planning the break-in, but in orchestrating the cover-up. In the end, the president himself was forced by the Supreme Court to deliver the evidence against him: tapes recorded in the Oval Office that included a conversation between the president and his chief aide, H.R. Haldeman, on how to block the FBI investigation of Watergate. That was the long-sought "smoking gun." When it was made public, the House Judiciary Committee quickly voted articles of impeachment and sent them on to the full House. That precipitated Nixon's decision to appear before the American people on Aug. 8, 1974, and announce his resignation. It was a great source of pride for President Ford that what happened the next day was orderly and calm. Gerald Ford and his wife, Betty, walked with President Nixon and his wife, Pat, to a helicopter on the White House grounds and said good-bye. And then, at noon, Ford entered the East Room of the White House, where Chief Justice Warren Burger swore him in as president. Speaking to the crowd assembled in the East Room, mostly members of the Nixon cabinet and staff, Ford said, "As we bind up the internal wounds of Watergate, more painful and more poisonous than those of foreign wars, let us restore the golden rule to our political process, and let brotherly love purge our hearts of suspicion and of hate." It was a sentiment shared by many Americans. But the honeymoon did not last long. A month later, Ford made an announcement that arguably doomed his presidency, granting Nixon a presidential pardon. 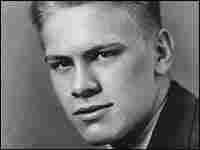 Gerald Ford grew up in Grand Rapids, Mich., working in the family paint factory and playing football. He was a star in high school and then college, playing center for the University of Michigan. Both the Packers and the Lions were interested in him, but instead of turning pro, he went to law school at Yale University and then straight back to Grand Rapids. He joined the Navy and then came back to Grand Rapids, where he started a law firm. He soon married and almost as quickly ran for Congress. Ford was first elected in 1948. In those days, when air travel wasn't as comprehensive as it is now, members of Congress typically moved their families to the capital while they served. "Gerald Ford managed, I think, as well as anyone to balance learning, understanding and becoming a part of the Washington community, and at the same time, never losing touch of his roots in Grand Rapids and with the people of the fifth Congressional District in Michigan," says Roger Porter, a professor of government and business at Harvard University, who worked in the Ford White House. "And he was someone who was able to live very comfortably in both of those worlds." Ford served in the House for 25 years, the longest tenure for any member of Congress who became president. Congress was a good fit for Ford. He liked the collegial atmosphere of the House as it was then. He formed lasting friendships with many of the people with whom he served, one of them, young U.S. Rep. Richard Nixon. In 1961, Ford was named "The Congressman's Congressman" by the American Political Science Association, a tribute to his understanding of the workings of the House of Representatives. Two years later -- in a revolt of young progressive Republicans called the "Young Turks," which included Donald Rumsfeld -- Ford captured the No. 3 spot in the GOP leadership. In 1965, he became the House minority leader. Ford still held that job in 1973, when Spiro Agnew resigned as vice president after pleading no contest to charges relating to a bribery scandal during his days as governor of Maryland. Under the 25th Amendment, which was only six years old, Nixon was empowered to choose Agnew's successor, but Congress had to confirm the appointment. John Robert Greene, Ford's biographer and a professor of history and humanities at Cazenovia College in New York, says Nixon chose Ford knowing that in the middle of Watergate, he was not in a position to choose just anyone. "Nixon put out a rather novel call to the leadership of both parties and asked them to fill out a questionnaire, and asked them who they would choose were they in his shoes," Greene says. "And in every one of these questionnaires, Jerry Ford came up No. 1." Ford's personal popularity in Congress wasn't the only reason that he was the choice of Republicans and Democrats. Republicans felt he would be loyal to the embattled president and, if necessary, a suitable replacement. Democrats believed that if he were to become president, he might be beatable in the next election. As expected, Ford had no difficulty being confirmed, although there were a few Democratic votes against him in the House and Senate. He had a vice presidential inauguration of sorts in the House chamber, where he was typically modest about his new role as vice president. "I'm a Ford, not a Lincoln," he said, prompting laughter. "My addresses will never be as eloquent as Mr. Lincoln's. But I will do my very best to equal his brevity and his plain speaking." When Gerald Ford became president in 1974, he was just 61 -- tall, fit and broad-shouldered. He seemed the polar opposite of the president he replaced. His straight-talking, down-to-earth approach to his new job helped the American people feel enormously relieved, and not especially worried that the man at the helm had never been elected to anything other than a seat in the House of Representatives from Grand Rapids, Mich. In his book The Presidency of Gerald Ford, John Robert Greene writes that Ford sought, in his inaugural "talk," to "wash Watergate out of the minds of the American people." That would prove difficult, even disastrous for President Ford, but on that summer day in the East Room of the White House, it seemed possible. At the end of his remarks, Ford spoke emotionally about his predecessor. "Before closing, I ask again your prayers for Richard Nixon and for his family," he said. "May our former president, who brought peace to millions, find it for himself." He held his first full-dress news conference on Aug. 28, 1974. Although there were many questions on many subjects, and although the new president handled them all with fluency, what he remembered were the questions about President Nixon, about a possible pardon, about presidential papers. "When that press conference was over," he later recalled, "I thought to myself, 'Is this going to be the routine from then on?' I finally decided that as a new president under very difficult circumstances, I had an obligation to spend all of my time -- all -- on the problems of 200 million Americans. And therefore, the only way to clear the deck, to get to the substantive problems that I faced, was to pardon Mr. Nixon and get his problems off my desk in the Oval Office. … It wasn't sentimental; it was purely practical. What I thought was in the best interests of all the people." On Sunday morning, Sep. 8, 1974, Ford granted Nixon "a full, free and absolute pardon." "In his mind, Ford had to do something to disassociate his presidency from Richard Nixon," Ford biographer John Robert Greene says. "He was absolutely clear to me that this was not out of any kind of great affection for Richard Nixon, nor was it out of any conclusion that Nixon was either innocent or guilty. What he decided to do was to try to just simply end the Nixon years. And his attempt to do that was a complete failure." Reaction to the pardon was swift and strong. The new president's popularity fell overnight from more than 70 percent to less than 50 percent. Jerald TerHorst, the Washington bureau chief of the Detroit News whom Mr. Ford had tapped as his press secretary, immediately resigned, calling it a matter of conscience. Newspaper editorials expressed outrage, as did many members of Congress. There was speculation that some sort of conspiracy must be afoot, some kind of deal with Nixon -- that the pardon could not have happened for the reasons that President Ford said it did. Finally, Ford agreed to return to the Capitol, taking the historic step of testifying before a House committee. Despite the hostile nature of many of the questions, Ford was adamant about his reasons for issuing the pardon. "I want to assure you, the members of this subcommittee, the members of the Congress, and the American people," he said, "there was no deal, period. Under no circumstances." This was an election year, and Republicans were concerned that they would pay a price at the ballot box. They were right to worry. That year, Republicans lost everything but the safest seats in the House -- down 43 seats in all. Ford ran for election two years later, in 1976, and lost to Jimmy Carter, the former Democratic governor of Georgia. Ford said the pardon probably contributed to his defeat because some voters "had a bitter hatred of Mr. Nixon. And anything that made him look better they resented, and in my case, that was a vote against me." As the 1976 presidential election demonstrated, the Ford presidency never recovered from the pardon. But Ford dealt with many other issues during his 29 months as president. The economy was a mess. Inflation was in double digits, but growth had stagnated --stagflation, it was called. In October, Ford addressed a joint session of Congress about the economy. Although he spoke of many kinds of governmental action, the part of the speech that stuck in people’s minds was his call for ordinary Americans to "Whip Inflation Now," by doing such things as wearing a WIN button. Although the buttons were initially popular, the idea was finally regarded as a public relations stunt. Nevertheless, other efforts Ford made did have a positive effect on inflation, notably his attempt to rein in congressional spending. He vetoed dozens of bills, forcing the heavily Democratic Congress to make unwelcome spending cuts in order to change bills into legislation that the president would be willing to sign. By the end of Ford’s term, inflation had fallen from more than 13 percent to about 4.2 percent. Another issue Ford faced was Vietnam. American troops had withdrawn in 1973, but the war dragged on. President Ford tried one last time to inject millions of dollars into the flagging South Vietnamese government, but Congress would have nothing of it. The next chapter came quickly. The South Vietnamese government collapsed, and days later, in April 1975, the capital, Saigon, fell. Americans remaining at the embassy were forced to beat a hasty retreat, evacuating into helicopters from rooftops as South Vietnamese friends and associates begged -- mostly unsuccessfully -- to be taken along. It was an ignominious end to a painful war, and by most accounts, it reflected badly on President Ford. But within weeks, Ford was able to turn public opinion around when an American merchant ship called the Mayaguez was captured by the now-communist Cambodian government. The president sent in the Marines. More Marines died than there had been sailors on the ship, but the vessel and the crew were recovered. Biographer John Robert Greene says Ford and his holdover secretary of state, Henry Kissinger, considered no other option than military force. It was a move that worked politically. The president’s popularity shot up. "It was very brief, but it was the high point of the Ford presidency," Greene says. Ford survived crises of another sort during two separate trips to California in September 1975, when he was the target of assassination attempts. Both of the assailants were women -- Lynette "Squeaky" Fromme and Sara Jane Moore. Afterward, Ford appeared unfazed and went about his business. At the 1976 Republican convention, President Ford was able to fight off a challenge from former California governor Ronald Reagan. But moderates staying with the president had growing concerns about his electability. One problem: Despite his presidential demeanor in crises like the assassination attempts, Ford had become a laughingstock of sorts, satirized on the popular TV show Saturday Night Live by the comedian Chevy Chase for his well-publicized pratfalls and accidents. But Ford caused some of his most serious problems himself, notably in the last days of the campaign. During a debate with Carter, Ford inexplicably insisted that nations behind the Iron Curtain were not dominated by the then-Soviet Union. The moderator challenged him on the statement, giving Ford an opportunity to change his words. But he did not. The Ford staff pointed out that the president meant that Poland and Yugoslavia did not consider themselves part of the Soviet Union, but the damage was done. Carter won the debate, and he carried the election by two percentage points and 297-240 in electoral votes. 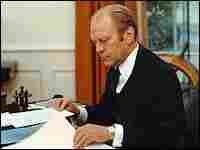 In 1977, Gerald Ford began what was a very long career as a former president. He and his wife Betty settled in Rancho Mirage, Calif. Like many former presidents, he wrote books, traveled, lectured, worked on his presidential library at the University of Michigan and played golf. But in retirement, something happened that changed the Fords' lives. In 1978 their children confronted Mrs. Ford about her alcoholism. "As we look back, that action was a savior not only for Betty's life but for mine, because when she stopped drinking, a year later, I did," Ford said. "And our action in stopping drinking extended both of our lives." Mrs. Ford's recovery inspired the creation of a new institution, which has become a part of American life and language: the Betty Ford Center, outside of Palm Springs, Calif., near the Fords' retirement home. It is difficult to assess the Ford presidency, which lasted only about two-and-a-half years. He came to the White House at a time when many people feared for the republic. Terrible things had happened that had never happened before. A president had been forced to resign in disgrace. Vietnam had been a divisive disaster, and a defeat, for the country. The economy was stagnant, the people depressed. Moving deliberately as he had through his career as a legislator, President Ford slowly tried to turn things around, with some success. Today, listening to President Ford's speeches and his news conferences from back in the 1950s through his time in the White House, one gets a picture of a bright, upbeat, patriotic man who believed strongly in free enterprise, muscular foreign policy, fiscal discipline and public service. He was very much what he appeared to be -- a son of the Heartland, a representative of the solid values Americans admire.